The driver of this BMW had a lucky escape – after it crashed through a fence which impaled the windscreen. A post from the railing smashed through the front screen coming to rest inbetween the driver and passenger seat. 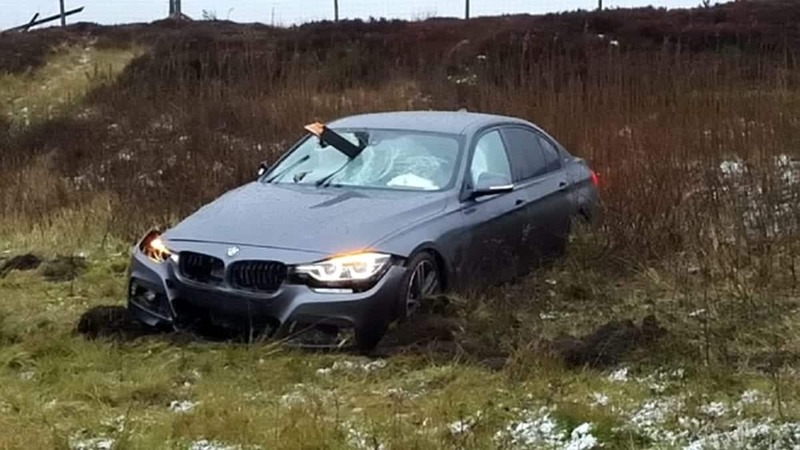 The accident happened after the car skidded off the road on the A628 Woodhead Pass, which connects Greater Manchester to South Yorks., in wet and icy conditions. Police said the driver was “very lucky to walk away”. Images posted online by South Yorkshire Police show the shocking near miss, that happened at 1.20pm on Tuesday. It added: “South Yorkshire’s roads are extremely wet today with standing water in many places, including on the motorway. Motorists have also been warned to be prepared for wintry conditions with some snowfall on Wednesday.